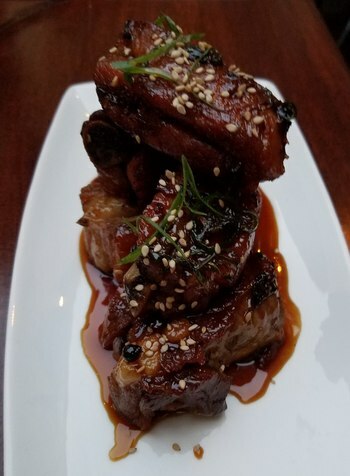 The pork ribs were served stacked three high and looked delicious. My wife loved them. She followed that with the pan roasted chicken breast with the butternut squash polenta which was also a big hit. Service was great and consistent and we dined in a lovely setting. The menu is not very friendly for vegetarians or vegans, except for Burger night which does offer a veggie burger. But, they publish their menu on their web site so I knew what to expect: The Restaurant (website). Alas, it was not burger night on our recent visit. I started with the shaved brussels sprout and kale salad (without the cheese). I found it crisp and refreshing. For an entree, I had the spaguetti and marinara sauce. This is their spaguetti and roasted garlic meatballs but without the meatballs and without the cheese. Both entrees, my spaguetti and my wife's pan roasted chicken breast were on the small side. The wine list looked nice including some don't-break-the-bank selections. We had the Pinot Noir for $160 pesos by the glass. Nice but not remarkable. My wife had the creme brulee for dessert. She is an expert on creme brulee. She makes it and she has eaten it at dozens of restaurants. It is her favorite dessert. "Maybe the best I've ever had," she said. Verdict: My wife loved almost everything about the place. Me, not as much. But, I'm sure we will be heading back on burger night in the near future.